Avoid eye contact with strangers. That didn’t take much effort. Ignore the annoyingly kind people greeting me, as I entered the school auditorium that had been transformed into a church sanctuary. That took much more effort, especially when it came to one lady. Joy. For some ridiculous reason, I wanted that pint-sized Jesus-Freak to corner me, to make me hug her, to break through my fake apathy and terrified defensiveness. Joy. Her name made me want to know her, to believe her smile meant she really cared. But the wall created by past hurts, and originally intended to protect my tender spots, wouldn’t allow me the luxury of risking the pain of rejection. 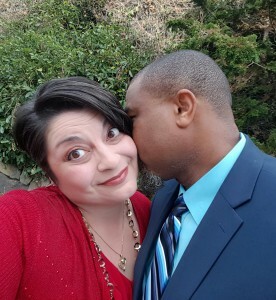 Barely dealing with the crumbling remnants of my marriage, I couldn’t afford exposing myself to more hurt. Still, a few questions kept me coming back to the church, to that exasperatingly contagious Joy. What if she wasn’t fake? What if she meant it when she said she was glad to see me? What if the Jesus she sang about really did the things her husband, the pastor, preached about? Determined to find out, I exposed myself to the potential pain. I wanted to, no, I needed to get to know this lady whose name and smiling face represented the emotion I thought I’d never experience again. Joy. That’s where my journey began. The simple commitment to try, to stop hiding from Joy and to open the Bible I’d stolen, so I could meet Jesus face-to-face, Jesus−the One she called Lord. My first attempt to read the Gospel of John on my own revealed more questions than answers. I surrendered my life to Jesus, by faith empowered by the Holy Spirit, in the midst of my desperate attempt to find relief from my pain. But it was when I first read John 1:1 that I truly began the lifelong adventure toward intimacy with Christ. Replacing “the Word” with “Jesus,” helped me better understand what the apostle proclaimed in this power-packed verse. Jesus is fully Man, and fully God in the flesh−Emmanuel God with us (Matthew 1:23). He is unchanging and divinely eternal (Hebrews 13:8). Because Jesus can’t be bound or manipulated by time constraints, we can follow Him with confidence when our circumstances feel out of control or purposeless. Because the maker of time can’t be bound or manipulated by time constraints, He can be trusted during waiting seasons, during heart-wrenching pain, and during the days when we feel like giving up or questioning His all-knowing power and unchanging goodness. But the apostle John doesn’t stop there. 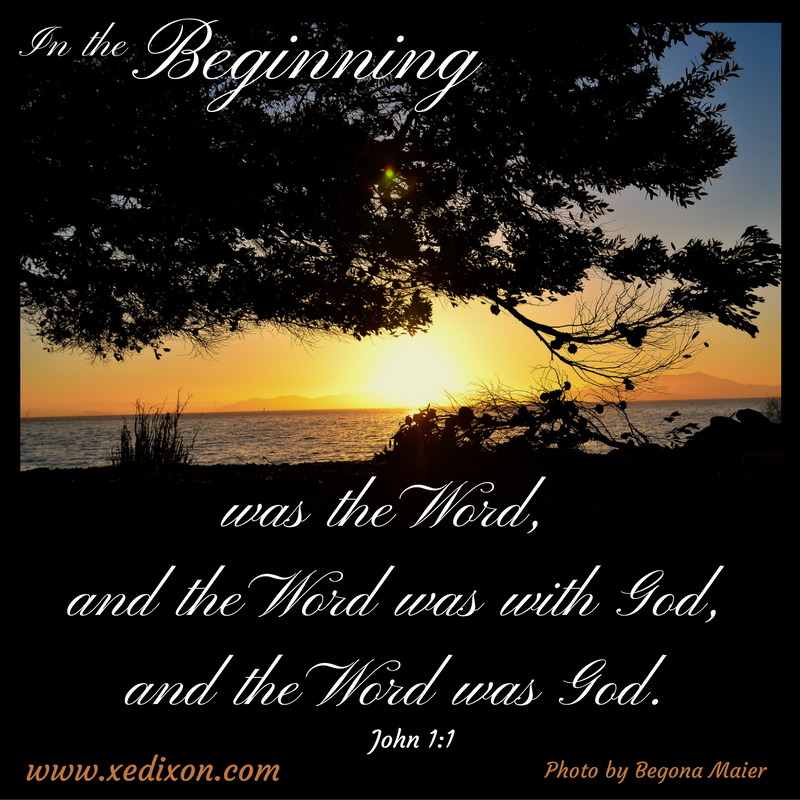 He clearly states that not only was Jesus with God in the beginning, Jesus was God, the Second Person in the Godhead. We can’t know the Father apart from the Son. We can’t know the Son apart from the Holy Spirit. And we can’t know God if we think He is three separate Persons who are not equally divine, or if we reject the Father, the Son or the Holy Spirit as united and divine. Jesus wasn’t just a good man, simply a smart teacher, or only a wise prophet. According to Scripture, God reveals Himself through His Holy Word, by the power of His Holy Spirit, as we look into the face of His Son, Jesus−the Word−the image of the invisible God (Colossians 1:15-20). Lord, thanks for knowing us, loving us, inviting us into relationship with You. Thanks for helping us trust You while accepting that we can’t possibly know or understand everything about You. Please give us the passion and diligence we need to commune with You through prayer and the study of Your Word. Help us recognize Your voice and live like we believe You as we accept the authority of Scripture and submit to the power of the Holy Spirit who transforms us through Your truth. If you don’t know Jesus, yet, or if you want to know Him and trust Him more, I encourage you to join me next week for “Life in the Word,” asking God to meet us face to face and transform us from head to heart. SPECIAL THANKS TO JOY, for loving me and praying for me until I was ready to open my heart to the love of Jesus. Meme created by Xochitl E. Dixon, using photo taken by and used with permission by Begona Maier. When I first started going to church, I prayed for one thing and one thing only. God help these people teach my kids about You so they’ll be able to handle the fallout from our divorce. I knew my decision to leave my husband would hurt our son, who already experienced a three month separation from his daddy, and my stepson, who I would have to leave behind again. Still, I saw no hope in reconciliation and refused to consider the possibility that I played a part in our constant conflicts. I planned my escape and desperately sought someone to equip the boys for the inevitable battle scars of a broken family. My search for a way to help my kids have faith, in a God I didn’t know personally, led me to a life-transforming adventure that began by meeting Jesus face to face in the Gospel of John. Jesus gently tugged my heart into submission, using His unconditional love and forgiveness to encourage me to stop running from my problems, from my past, from Him, and from myself. He surrounded me with women of God who equipped me to grow spiritually, instead of making me depend on them to anchor my faith in their ability to believe. One lady bought me a Bible and insisted it was only through knowing God’s story that I’d be able to know Him personally. After I got over my initial concerns about her needing mental help or medication, I struggled with a strange desire to see if she was somehow . . . right. Determined to find out, I started asking more questions, praying, and reading Scripture daily. I accepted Christ as my personal Lord and Savior, on December 14, 2001, and asked the Holy Spirit to make me more like Jesus. Warning: Growing pains are usually not pleasant or quick in passing. But grow we did. My husband committed his life to Christ and, in August 2003, we were both baptized with our son, Xavier. By God’s abounding grace, we’re still growing. 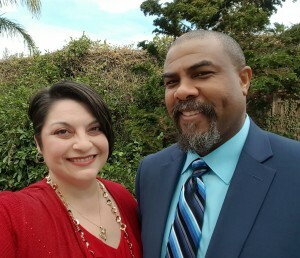 We celebrated our 22nd anniversary on March 26, 2016, and have been together 25 years. That’s over half my life. Wait. I have to let that sink in for a bit. Although some days are harder than others, especially with my current health issues, I’m looking forward to what God has in store for us as individuals, as a couple, as a family, but more importantly, as His beloved children and grateful servants. This is a lifetime commitment, a privilege and an adventure that requires courage, not complacency. 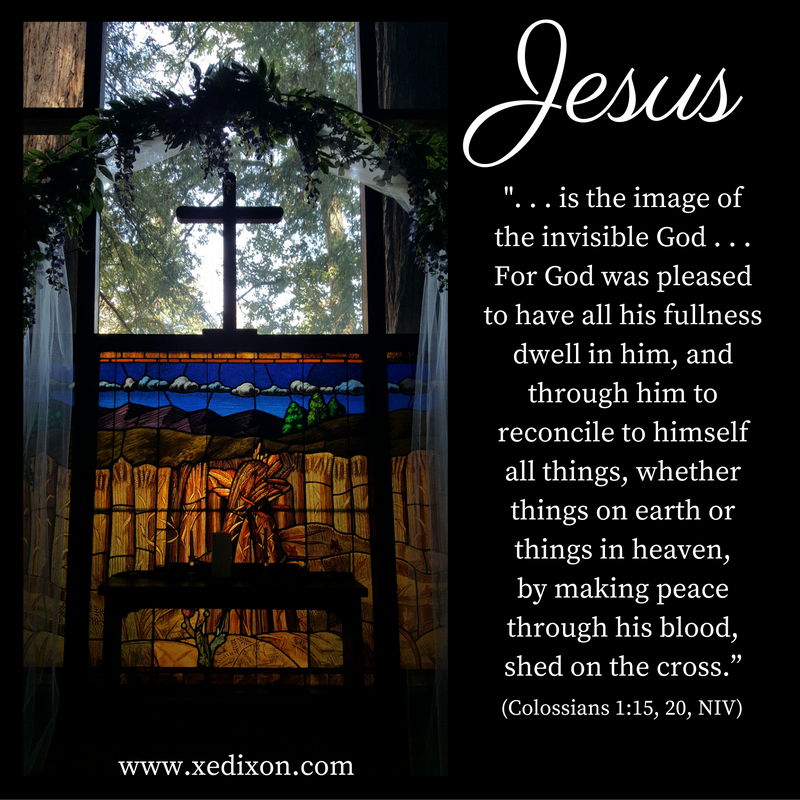 The apostle Paul said Jesus “is the image of the invisible God” (Colossians 1:15, NIV). To know God better, I can’t think of a better place to start than by meeting Jesus face-to–face through the Gospel of John. A version of this article was originally posted on July 8, 2015. After a wild ride of trusting God through a difficult season in my healing journey, I’m ready to resume our journey through the Gospel of John. Together, we can ask God to meet us face to face and transform us from head to heart. Today I found out another friend received a cancer diagnosis. As I grieved for her and her family, I approached God’s throne of grace with pleas for a miracle of His healing mercy. Then, I started to think about all the hurting people I know. I thought about the people I’ve been praying for, the people who encourage others as they trust the Lord during their own battles. A tender heart can feel overwhelmed when surrounded by an abundance of bad news and sorrow. What begins as empathy can slip into a codependent need to fix things. We can be tempted to question how God can be trusted when suffering continues to trickle into our lives and the lives of those we love. When my spirit feels weary and worn, as I endure my own struggles and pray for others who are hurting, I head straight to the psalter. As the psalmists pour out their anguish and their praise, God reminds me that He understands our need to process our emotions. He affirms who He is and what He’s done, assuring me that He is the same compassionate and capable God that He’s always been. The Bible is full of Wonder Lists, testimonies of God’s unchanging character and the personal and powerful ways He initiates encounters with His people. When I can’t find the words to pray, I read the Bible and listen to praise and worship music. The God-breathed words in Scripture and the song lyrics of Christian music based on Scripture often become my prayers. A personal Wonder List confirms God’s constant presence and divine intervention in my own life, and fills me with hope as the Lord empowers me to encourage others. I’d appreciate your help in adding to my Wonder List in the comments section of this blog post. Together, we can praise God for promising He will always work wonders that we can share with the world. We can toss these words out in response to something good happening, without even considering the meaning of the phrase. With these three syllables strung together, we can express relief, gratitude, and joy. Yet, we can totally miss the magnitude of the meaning this phrase holds. The psalter bursts with shouts of praise unto the Almighty God. As a psalmist, King David exalts the Lord with an unparalleled quickness, consistency, and sincerity. Eavesdropping on his prayer time reveals a depth of faith built solely on his intimate connection with the one and only eternal Rock−Creator, Sustainer, and King of Kings. After being delivered from his enemies, David begins his song with a proclamation of total devotion. The king declares his adoration and affirms God is his strength, not just the distant provider of power. The Lord is the fortified foundation on which David stands. The king holds his head up with confidence in God’s promise of deliverance, safety, and protection. Never spared from adversity, David experienced desperation, depression, discouragement, and doubt. Still, his confidence in God paints his perspective with expectation. He pours his heart out to his Creator then testifies to anyone within earshot. Though David accepts dark times as inevitable, the Lord Himself becomes his beacon of hope during those times of suffering and affliction. Assurance of God’s faithfulness in character and the unchanging power of His Word evoke David’s praise and obedience. The psalmist chooses to trust in the living God who intercedes intimately in the lives of those who place their trust in Him, while maintaining His transcendence. We can skim by this verse and miss savoring the power of the king’s proclamation. David experiences a personal closeness with the Lord, the living God and Savior who was and is and always will be above all and near all. This closeness is available to every person who calls God. When we’re hurting, our Heavenly Father feels our pain. When we’re anxious, He invites us to place our burdens in His capable hands. When we’re desperate or blinded by fear, insecurity, depression, or doubt, the one and only Living God intercedes with matchless power and lovingkindness. 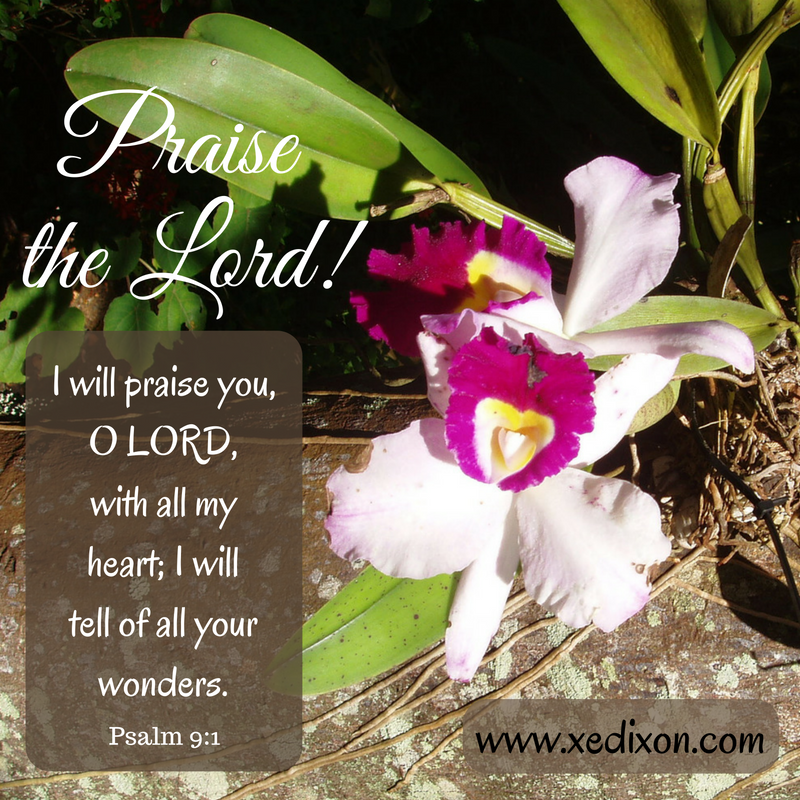 Let us honor, admire, commend, and worship, yes, let us praise the Lord. He lives. He saves. He is God. Let us place our tender hearts into the hands of the One who is and always will be worthy to be trusted, exalted, and obeyed. Praise the Lord! Praise the Lord! Praise the Lord! Almighty God, than You for empowering us to recognize Your voice, which always aligns with the living and active words You’ve given us through Scripture. Please help us cleave to Your promises with hearts that remember You are eternal and unchanging. May gratitude and joy burst forth in contagious praise, whenever we think about all You are and all You do. Please never let us forget the reasons David praised You, or the reasons You are worthy of all our praise in the midst of all our circumstances. You are and always will be our living God, our fortress, our refuge, our Savior. Hallelujah! Wait. Hold on. Not yet. Be patient. These are not phrases most of us welcome with joy. Waiting can be anything but joyful. 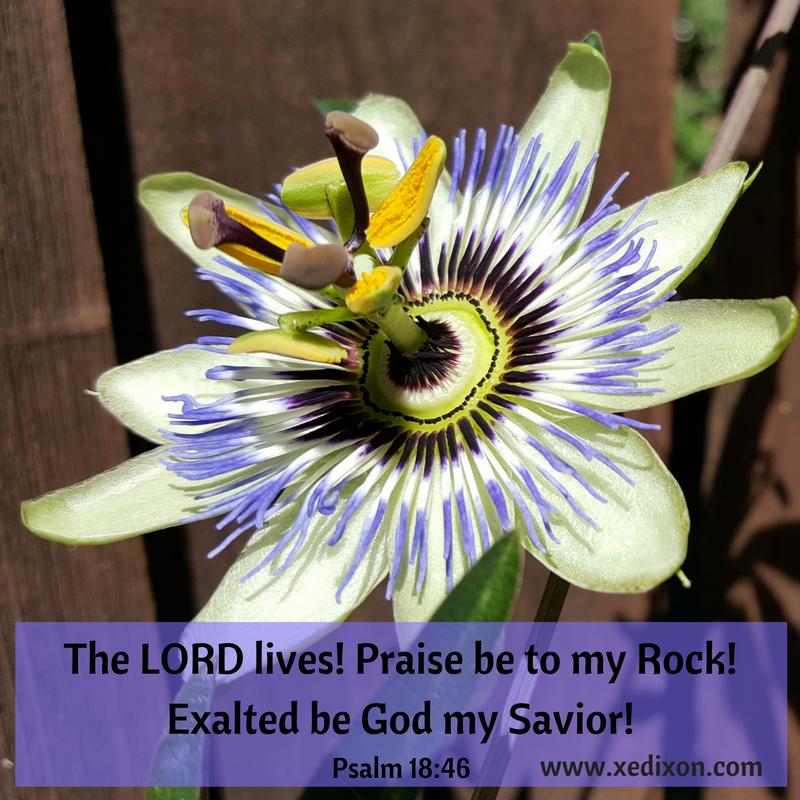 So how could King David praise God while stuck in the wait? He shares a few secrets of his unshakable faith in Psalm 5. David doesn’t fear being honest with God. He approaches prayer with boldness, sure of the Lord’s great love for him. I’ve fussed and whined my prayers countless times. I’ve begged God to hear me, pleaded for flashing neon lights to acknowledge He heard my cries. I’ve related to David’s desperation many, many times. Those words burst with surety, a confident faith in God’s intimate connection with His people. David knows God is hearing his voice. He fully expects the Lord to work as he waits with complete trust. How can a man who has endured so much suffering cleave to God with such assurance? He acknowledges his need for and the greatness of God’s mercy. He moves closer to God, entering His presence to worship with total devotion and awe. He focuses on who God is, on what He’s done and what He’s capable of. The joy of taking refuge in the Lord hinges on His ability, not our inabilities. God is our protector, our source of joy. Knowing and loving the Lord intimately begins with resting in His constant and powerful presence. He fuels our faith as we immerse ourselves in His unchanging truth, refusing to be distracted by our ever-changing feelings, wants, or circumstances. Like David, we can count on God to wrap us in His lovingkindness. We’re protected, provided for, and pruned for His greater purpose. God, the Maker of the Universe, hears our voices. God, the Giver of all good things, cares about us. God−the Savior and Redeemer of the World, the One who was, is, and always will be−invites us to lay all of our requests before Him, to place all of our concerns, big and small, into His loving and capable hands. 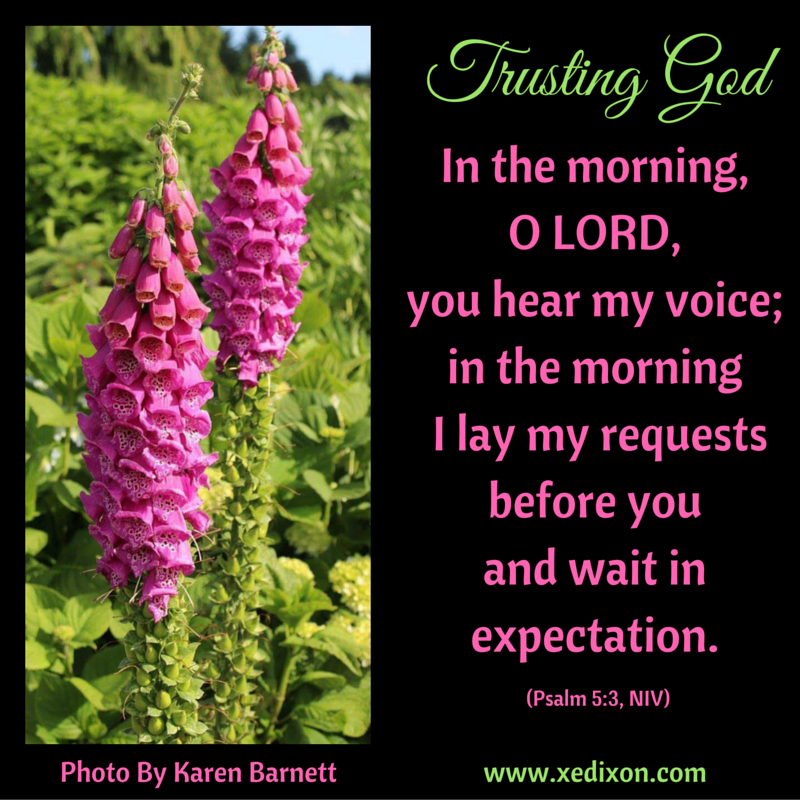 We can trust the Lord with great expectation. God will hold us close during the wait and answer us, in His perfect timing and according to His perfect will. Meme created by X.E. Dixon, using photo taken and used with permission by author Karen Barnett (www.karenbarnettbooks.com).